Emerging research suggests that compounds in blueberries known as flavonoids may improve memory, learning and general cognitive function, including reasoning skills, decision making, verbal comprehension and numerical ability. 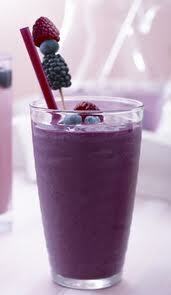 People who drank a blueberry smoothie in the morning were better at concentrating later in the day. A study at Surrey University in Guildford found just this. The first day of the experiment, individuals were given a breakfast of toast and marmalade, followed by a mid-morning smoothie made from 200g of blueberries. An hour after the study they carried out 45-minutes of computer based mental tasks that measured their short-term working memory and concentration. The tests were again repeated five hours later. 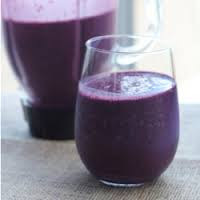 Two weeks later, the volunteers performed the same experiment, however they drank a "control" smoothie without any blueberries (but contained the same amount of sugar and calories). 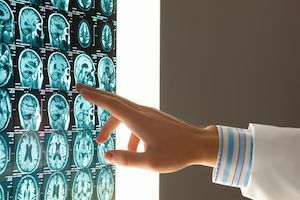 The results were no different for the test performed one hour later, but the test that came five hours later showed significantly reduced performance. However, those volunteers who consumed a blueberry drink saw no decline in mental powers. So, as the day wore on, those individuals who did not drink the blueberry smoothie had reduced performance and concentration, whereas those individuals who did drink a blueberry smoothie were performing extremely well. Flavonoids in berries activate an enzyme in the body called Enos which increases the flow of blood and oxygen to the brain. Without this boost, our brains become weak and un-concentrated later in the day, and we often find it hard to concentrate. Blueberries are not only rich in antioxidants (including anthocyanins, proanthocyanidins, resveratrol and tannins), but are also thought to protect against cancer and heart disease and may even prevent dementia! Put all the above ingredients in a blender, and pulse blend for 15-30 seconds! Enjoy! *Note: always buy organic berries - conventional berries are one of the most highly sprayed produce on the market! Note: These ingredients are just a guideline be creative and make the best smoothie ever, keeping in mind the caloric and sugar contents. Use oranges if you need a sweeter drink. Place the dry oats in the carafe of the blender pour in the liquid then add the fruit. Place the top on carafe and refrigerate overnight. Place 4 glasses in freezer. 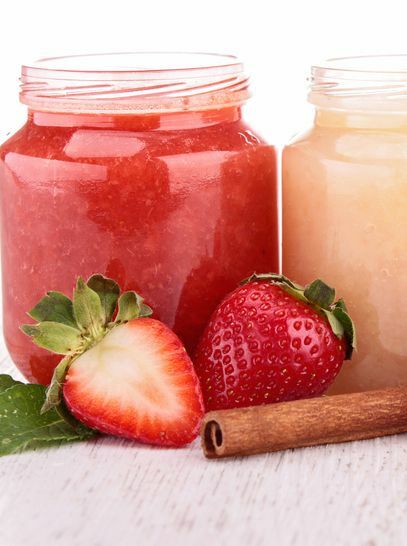 Place carafe on blender and puree 3 – 5 minutes or until the texture is pudding like. While blending, make sure you have a vortex going, if not slowly add more liquid until ingredients are rapidly spinning. Distribute contents of blender between the four frozen glasses (~12 ounces each). 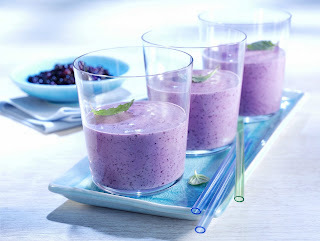 Blend together the frozen blueberries, banana, apple juice and coconut milk. Blend until smooth. Add in the fresh blueberries and blend until smooth and creamy or leave it chunky. We are always looking to discover new ways of making our lives easier through innovative inventions. What we often fail to understand however, is that not all inventions are good for our health. Microwave ovens are one such invention that have been widely mistaken as a healthy convenience. Do you rely on the convenience of a microwave over a stove, to cook or heat your food? If yes, then you might want to stop and think again before placing your life in the hands on this so called “harmless” man-made invention. Microwave Oven – Not Really Harmless? The first microwave oven was invented by Raytheon after the World War II. Back then, it didn’t seem like such an important invention for home use. A few years later, microwave ovens gained a lot of popularity for reheating previously-cooked foods and cooking vegetables. Over the last couple of decades, microwave ovens have become a necessity, and now you will rarely find a kitchen without one! Today, over 90% of homes in America, use microwave ovens for re-heating foods, and for daily meal preparations. It is so easy to use as it just takes a few minutes to get the meal on the table “ready to eat”. 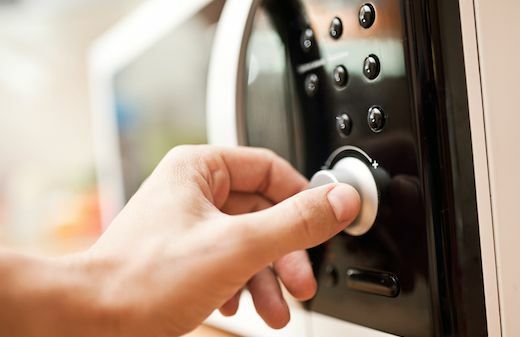 However, as you may already know, a microwave oven essentially uses microwave radiations to heat polarized molecules in food. Unfortunately, these microwave radiations have been found to distort the molecular structure of foods. As a result, microwave preparations lack healthy nutrients as most of them are destroyed during heating! Did you know that the Soviet Union banned microwaves in 1976? Why do you think they would do so and yet the American Government still hasn’t warned us anything about it? Microwave ovens continue to be used in every home, and the reason is simple – microwaves are convenient and energy efficient way of preparing food. Is Microwaved Food Both Safe and Healthy? Here, are a few studies and results that indicate why this may not be the case. It has been found that cooking food in microwaves is an unhealthy and unnatural approach for preparing baby food. According to Young Families, the Minnesota Extension Service of the University of Minnesota published in 1989, milk bottle heated in microwaves may cause harm to the baby who drinks it. High milk temperature (often resulted due to overheating) could not only burn a baby’s mouth and throat, the steam all encapsulated in the bottle may also cause the bottle to explode due to the presence of radiation gases within it. Maybe these effects can be ignored or averted, but the fact that milk heated in a microwavemay change the molecular structure of the milk is something that calls for attention.Microwave radiations can cause the essential nutrients in the baby foods to be lost, making them unfit for consumption. It’s just like feeding fake milk to the child with no real nutrients at all. The study further confirmed that it may be better and much safer to heat the bottle by placing it under a tap of warm water for a few minutes than to heat it in a microwave oven. Another shocking discovery about microwave radiations came into the limelight when a nurse in an Oklahoma hospital used microwaves for warming the blood used for transfusion in a patient. The patient immediately died because of this transfusion. It was found that microwaves injected some kind of destructive substances in our blood when we heat it. To understand why microwaves are dangerous for health, a study was carried out by Raum & Zelt in 1992 which showed some noticeable changes in the human build after consumingmicrowave heated milk and vegetables. In this study, 8 volunteers ate different combinations of the same food cooked in different ways, which caused different changes in the blood of the volunteers. Hemoglobin, which is an important constituent of blood decreased while white blood cells and cholesterolincreased. Lymphocytes, which provide immunity to the body, also decreased which is quite an alarming sign. Bacteria also increased after eating the microwave heated food. A food scientist by the name of Dr. Hans Ulrich Hertel who worked with one of the major companies of Switzerland carried out a research which showed striking discoveries about cooking food in microwaves. 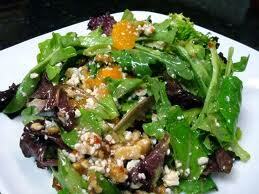 Dr. Hertel was fired from his company because of raising questions on how the food was prepared. His famous research with a Lausanne university professor which showed that food cooked in microwaves has cancerous effects. Dr. Hertel and Dr. Bernard H. Blanc collaborated on a clinical study at the Swiss Federal Institute of Technology and the University Institute for Biochemistry. Determined to study the physiology of the human body, Dr. Hertel carried out experiments to find out the effects of “microwaved” nutrients on human blood. He showed that microwave radiations completely destroy the nutrients in the food and could cause very bad effects on the human body. He also found out that microwaved food decreased hemoglobin in our body and could increase the cholesterol levels. Comfort OR Health? The Choice Is Yours! The FDA, the government and even the manufacturers themselves may never tell you these harmful effects of cooking food inmicrowaves. As it is evident, microwave ovens are not really the recommended method of cooking. You could either live in denial and keep on using it or give your life some value and start cooking food on stoves. Use the conventional and the safer way! Remove steaks from the refrigerator 30 minutes before grilling and season both sides with granulated garlic, onion, salt and pepper. Preheat grill to high, cook for 3 to 6 minutes per side for medium rare. To create attractive cross-hatched grill marks, using tongs, give the steaks a quarter-turn halfway through cooking on each side. When done, allow the steaks to rest for 10 minutes before cutting them. This helps them retain their juice. Note: Use your finger and poke your steaks. 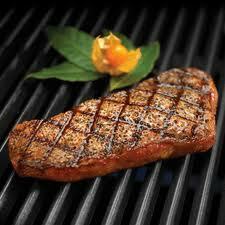 As steaks cook, they becomes firmer and firmer. A rare steak has a lot of give [like pudding]; a medium steak feels springy [like jello]; a well-done steak feels very taut [no movement]. Wash potatoes and scrub with a vegetable brush, cut off any bad spots or blemishes, but do not peel. Cut potatoes into 1” dice. Place potatoes and bay leaf in a pot of cold water and bring to a boil. Boil until potatoes are just fork tender about 13 minutes. 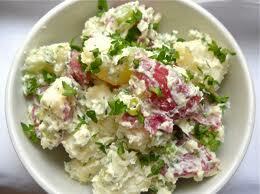 Thoroughly drain potatoes, discard bay leaf and place potatoes in a bowl. While potatoes are still hot, season them with salt and pepper then mix in the white wine vinegar. Spread potatoes out to cool on a sheet pan [cookie sheet] and let them sit for about 15 minutes on the counter before placing them in the refrigerator. Let potatoes cool in refrigerator uncovered for 30 minutes. Once potatoes have cooled down, add in all vegetables and mix thoroughly then add the cheese, mayo and cream and mix thoroughly. Cover, return to the refrigerator until salad is cold. Heat a Dutch oven on top of the stove add oil, onions, garlic and allow them to simmer for a few minutes. 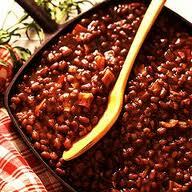 Add pinto beans, vegetarian beans, tomatoes, seasoning and spices, mix thoroughly. Add brown sugar, molasses, barbecue sauce, water and bay leaves. Remove beans from oven, uncover and stir. Taste for seasoning and adjust accordingly. Add all of the sauce ingredients to blender and puree. Transfer to a large baking dish, add the salmon fillet, cover with sauce and let it marinate for 1 hour. 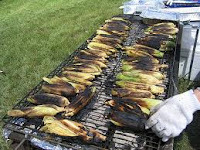 Preheat a grill to medium, and the coals have a light grey ash color. You are going to cook the salmon slow and on low heat. Wipe the grate of the grill down with oil and place the salmon fillet on the grill. Spread ½ of the remaining jerk sauce over the fillet and grill for approximately 6 minutes. Flip the fillet then spread it with the remaining jerk sauce. Let it grill for an additional 6 - 7 minutes. Remove the salmon from the grill to a serving platter and serve. 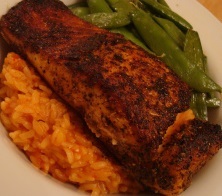 Please remember, it’s better to under cook your salmon than to overcook it. Remove after 13 minutes of cooking and let it rest for 5 minutes before cutting. If after that, it’s still not done to your satisfaction then return it to the heat 1 – 2 minutes. Wash and pat dry the chicken with a paper tower. Mix together the salt, pepper, granulated garlic, granulated onion and paprika. Sprinkle season generously over the chicken breast, cover and let it marinade three hours or overnight in the seasoning. Meanwhile, preheat grill to high heat. Using a grill pan, grill onions for 10 minutes, stirring occasionally. Remove onions and allow them to cool for 5 minutes. Mix onions, cheese, chopped basil and ½ cup of barbecue sauce in a bowl. 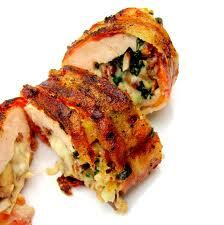 Spread the barbecue cheese mixture on the chicken breasts. Roll up chicken breasts and secure with tooth picks to hold mixture in while grilling. Grill over high heat until cooked to 165 degrees, about 5-8 minutes per side. Spread the remaining barbecue sauce over chicken during the last 3-5 minutes of cooking. In a medium bowl, whisk together all of the marinade ingredients. Add the vegetables and make sure marinade is covering them. 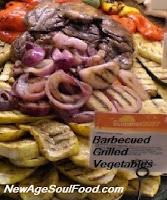 Let vegetables marinade for at least an hour..
Place vegetables directly on an oiled grill or on skewers. brushing occasionally with the sauce.